This December it's time for Addictive Behaviour to turn over the page to the next chapter as we reach the 5 year marker of our D&B journey. 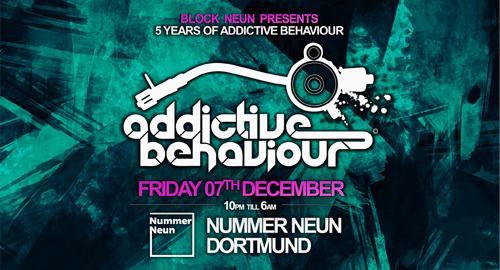 To celebrate this achievement we are setting off on the first of our 5 year tour parties, bringing the Addictive sound to Dortmund, Germany. We'll be flying in a selection of our UK artists to join our German counterparts for an all-out international Addictive showcase in the centre of Dortmund at the recently renovated Nummer Neun venue. Come and join us as we celebrate 5 years in the game with some firing beats from this stellar lineup.